Marathi films, marathi movies are always counted amongst most entertaining as well as realistic movies within Indian film industry. 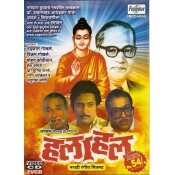 We have wide variety of CDs, VCDs, DVDs of marathi films and movies - right from old to recently released ones. Few of them are Bharatiya, Balgandharva, Kela eshara jata jata etc. This section showcases our entire collection of Marathi movies, films, chitrapat.